As the dust settles on the Tax Act, it’s time to consider what it means for investors. Here are three strategies advisors should discuss with their clients. When the Tax Cut and Jobs Act of 2017 was being negotiated, there was a consensus in Congress on a key issue: align the tax treatment for multinational C-corporations more closely with our G7 trading partners and the great majority of the Organization for Economic Cooperation and Development (OECD) countries. That led to tax reform for C-corporations. But for the other parts of the tax code, including the portions that affect individuals and pass-through business entities, there wasn’t the same consensus. Some call the end result in the individual tax system and the new deduction for pass-through enterprises tax reform, but my criteria for reform is actually making structural changes to the system. That’s why, at the individual and pass-through entity level, I would describe the Tax Act of 2017 as tax editing. What does this mean? We have the same overall tax system as before, but with some changes in the details. In some cases the changes are minor and in others significant. Plus, there is one very important matter that shouldn’t be overlooked. Like the signature tax cuts under the George W. Bush administration, almost all of the changes affecting individual taxpayers and pass-through enterprises are under a sunset provision. Unless Congress acts to make all or a portion of the changes permanent, most will be rescinded effective for tax year 2026. 1. Increase itemized deductions through strategic charitable contributions. The Tax Act of 2017 increased the standard deduction to $12,000 for single filers and $24,000 for joint filers and significantly lowered itemized deductions through a $10,000 cap on the deduction of state and local taxes (SALT) and by eliminating miscellaneous itemized deductions. It’s estimated that the U.S. will go from 49 million itemized deduction filings down to 19 million.¹ But whether taking the standard deduction or continuing to itemize, affluent and high-net-worth taxpayers will want a strategy to increase the deductible amount when they have a “big year” of increased taxes. Charitable contribution deductions can now be as much as 60% of adjusted gross income for public charities and certain private foundations, but taxpayers may not have a lot of time to decide where to direct donations if they have a “big year.” An effective way to significantly increase charitable contributions in a given year and still have the time to consider the final destination of donations is through a donor-advised fund (DAF). A donor-advised-fund is a registered charity that allows taxpayers to make a large charitable contribution to the DAF (a charity itself), and then consider where they want to direct charitable contributions over time. And DAFs are often better positioned than most 501(c)(3) organizations to accept appreciated shares as a donation, thus avoiding capital gains tax. One downside is that the money can’t be directed from the DAF to the charity of choice if the donor gets a personal benefit. So, it may not be a good fit for those who want to buy tables at fundraising events or receive a premium for donations above a certain size. And a donor cannot use a DAF to redeem a personal pledge such as a multiyear commitment to a capital campaign. A careful reading of the DAF rules is in order. Otherwise it’s a flexible approach to bundling charitable contributions in a given year, and financial advisors often have short-lists of DAFs that they use regularly. Key thought to discuss: How do I use donor-advised funds to make strategic charitable donations? 2. Strategize to make the 199A deduction work for owners of pass-through entities. Very few businesses in America are C-corporations (about 8%) — most are structured as sole-proprietorships, S-corporations or partnerships, which are referred to as pass-through entities.² When a pass-through entity has a profit or loss, it passes through to the owner, and the owner(s) or partner(s) are each taxed on their share of the business’s income or loss at the individual level, at rates up to 37%. Because most businesses in the U.S. are set up as pass-through entities, this was one of the hardest things for Congress to figure out. What they ended up doing was creating a new and temporary section 199A deduction on qualified business income (QBI). Section 199A allows pass-through entity owners and partners to lower the rate of tax on QBI by as much as 20%, thus decreasing the amount of tax they have to pay at the individual level. But the 199A deduction depends on the type of business. 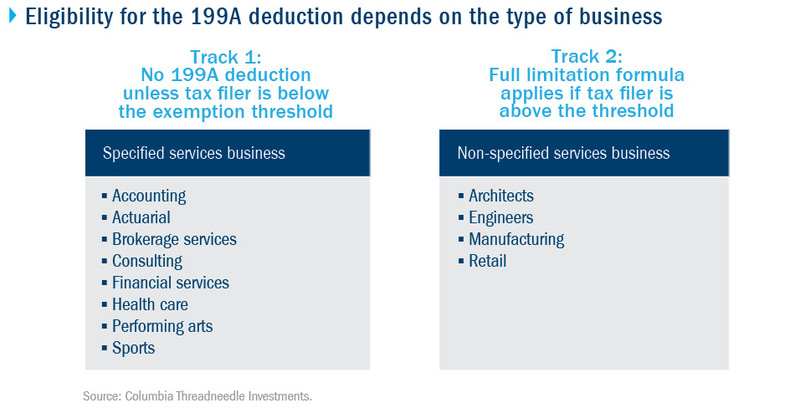 Specified services businesses, which are businesses that rely on the owners’ intellectual knowledge, are not eligible for 199A deductions unless the owner’s taxable income falls below a certain taxable income threshold, and even non-specified services business owners/partners face limitations on the deduction depending on their amount of taxable income. Owners of both types of businesses face a limitation in the phaseout range of taxable income ($50,000 single and $100,000 joint). For taxpayers who own a non-specified services business, Congress went a step further and put in place a wage and capital limitation formula, which applies both within and above the phaseout range. If the individual taxable income is too high (as a single, joint, or head of household tax filer), there are limitations in the ability to take the 199A deduction unless the owner’s share of the business’s W-2 wages and capital expenditure is greater than their share of qualified business income. Many business owners are trying to figure out what they can do to qualify for this deduction, or reduce limitations on the deduction, or take advantage of the wage and capital formula. If the business can lower the amount of qualified business income that’s passed through to the individual owner or partner in a way that reduces the owner’s taxable income below a limitation threshold, it may allow for greater use of the 199A deduction. There are a variety of ways they can do this, including investing more money into the business, hiring more people (more W-2 salary expenses) or upgrading their qualified retirement plans from IRAs to 401(k) defined contribution plans and adding cash-balance plans. 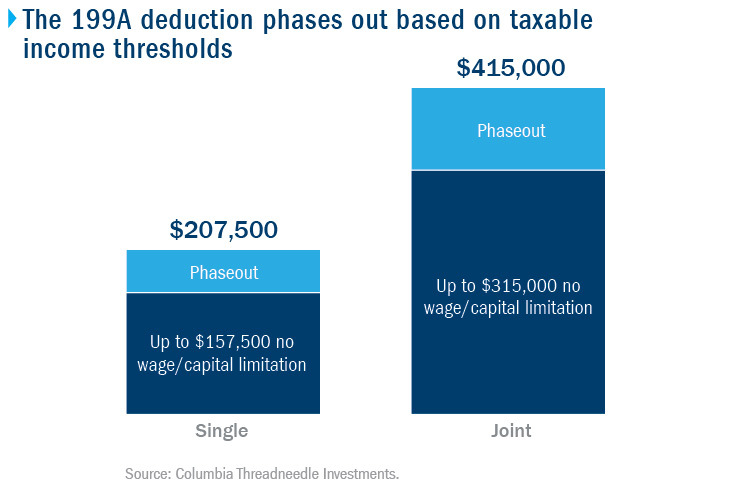 Reducing pass-through business income may help decrease the owner’s taxable income for purposes of QBI limitation thresholds, but it may also reduce the amount of deductible QBI, so this strategy has both pros and cons. Key thought to discuss: What income deferral strategies can the business or the individual (including a spouse, if married filing jointly) use to lower taxable income? 3. Understand your supplemental compensation, including stock options. Successful employees are often rewarded with various types of stock compensation. Incentive Stock Options (ISOs) are a form of stock compensation that can qualify for favorable treatment in the standard individual tax system. Exercising ISOs in a qualifying way defers tax liability in the standard tax system, but the spread between the exercise price and the fair market value of the stock is included as alternative minimum tax income, which potentially creates an alternative minimum tax (AMT) liability. Changes to AMT in the 2017 Tax Act could increase the overall tax advantage of ISOs by reducing or eliminating AMT liability at exercise. AMT was originally established to address a very small minority of wealthy families who could avoid paying any federal income tax. When Congress established the AMT many years ago, it was not indexed to inflation. The result: an increasing number of merely affluent households (approximately 5 million tax filers) became subject to AMT. The Tax Act of 2017 greatly reduces this number by substantially increasing the AMT exemption amount and limiting the phaseout of the exemption to high-income taxpayers. The Tax Foundation expects there will only be about 200,000 tax filers this year paying AMT. One implication of this change is that there may be a resurgence of ISO grant offerings, particularly at pre-IPO firms. The AMT changes also mean that current ISO grant holders should reassess their exercise approach and not default to an approach that disqualifies them from tax deferral and a full long-term capital gain treatment at sale in the standard tax system. The special ISO tax incentive rewards holding the stock for the requisite time of at least one year from the exercise date and two years from the grant date. By following this approach, called a qualifying disposition, any standard tax liability is deferred until the stock is sold. Upon sale, the entire spread between the exercise price and the fair market value sale price is taxed at the relevant long-term capital gain rate(s). Now, with fewer tax filers subject to the AMT, it makes sense to review stock option grants and determine if exercising ISOs in a qualifying disposition is an enhanced tax-efficienct strategy. Key thought to discuss: What are my supplemental compensation arrangements, including stock options, and can I exercise them more tax efficiently than before? Advisors and investors can work together to find the best positioning for the changes from the Tax Act of 2017. Focusing on strategic charitable deductions, the 199A deduction for owners and partners in pass-through entities and reviewing incentive-stock option exercise strategies are three good places to start. ¹ Tax Policy Center. Effects of the Tax Cuts and Jobs Act, June 13, 2018. ² U.S. Census: Universe of County Business Patterns, 2016.